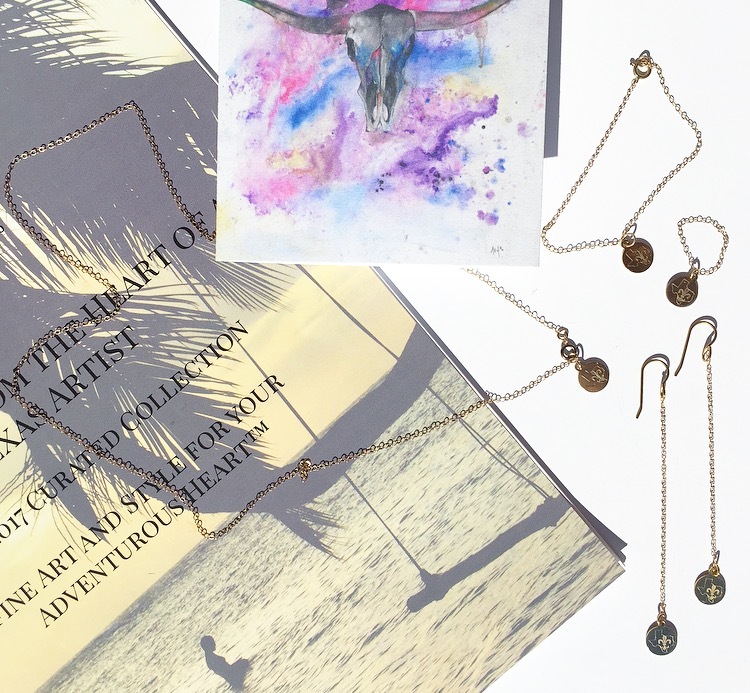 Unleash your adventuress spirit with a treasure trove of jewels, fine art, and stories inspired by Mona Lamar's ardent adventures in Sketches from the Heart of a Texas Artist. In each box, you'll find uniquely selected jewels from a different chapter in the book, a giclee watercolor illustration and a piece of prose to ignite your passionate soul. Every two months, you'll receive a new box of treasures to inspire you as you move through this journey called life. Your first box includes a Passport Journal, so that you can begin to journal toward your destiny and write your own Hero's Journey and each box following will include thought provoking messages to evoke soulful wanderlust. Each of piece of jewelry is constructed by hand, using goldfill metal and a combination of both semiprecious and precious stones and minerals and the art is printed on archival paper. Each piece of jewelry is just as unique as the adventuress who wears it. No two pieces will ever be alike. With, over $500 worth of Jewelry, Fine Art, and Literature in each box, for a $250 bi monthly payment, this is an ideal way to indulge your Adventurous Heart™. This is your adventure, your Hero's Journey, your story to tell! Surrender to your passions and let your adventurous heart guide you! Questions about the Adventuress Box?